Enrolments in Canadian public postsecondary institutions (colleges and universities) totalled 2,034,957 in the 2015/2016 academic year, the fourth consecutive year enrolments have exceeded two million. The findings provide additional insights that complement the recent results from the 2016 Census of Population, which presented an educational overview of the Canadian population. Educational activities offered in postsecondary institutions include programs for which students can ultimately receive a credential such as a certificate, diploma or degree, as well as activities that do not lead to an actual qualification. The latter comprise activities such as general interest courses, open studies, and enrolments of visiting or exchange students. In 2015/2016, 91.1% of enrolments were in programs that could lead to a credential. The average age of the students enrolled in these programs was 24. Over half (56.3%) were women, and the majority (80.8%) were registered as full-time students. About 6 out of 10 enrolments in programs that could lead to a credential were at the bachelor level or above, with most of these students enrolled at universities. Colleges, in turn, represented 3.9% of degree-granting institutions in 2015/2016. Career, technical or professional training programs accounted for about 2 out of 10 enrolments in 2015/2016. The vast majority of such programs are offered in colleges. Almost 9% of the 2015/2016 enrolments were in educational activities that do not lead to a credential. The average age of these students was 32. The majority (77.9%) were registered part time, and over half (58.4%) were women. These non-credential activities represented 15.4% of enrolments in colleges (compared with 5.3% in universities), and accounted for 59.4% of all educational activities in the territories. Women represented 56.3% of enrolments in programs that could lead to a credential, a proportion that has remained relatively stable since 1992. Despite an increase in the number of women enrolled in a program leading to a degree in science, technology, engineering, mathematics and computer sciences (STEM), men still outnumber women in these programs. Women's share of enrolment in these programs has remained stable since 2010/2011 at around 39%. At the same time, the number of women enrolled in STEM programs has increased, from 104,943 in 2010/2011 to 130,623 in 2015/2016. By contrast, women represented the majority of enrolments in degree programs in most fields of study in 2015/2016, especially in education (76.0%) and health and related fields (72.9%). Meanwhile, men accounted for 76.4% of enrolments in architecture, engineering and related technology, and 72.2% in mathematics, computer and information sciences. During the 2015 calendar year, 513,141 students received a credential such as a certificate, diploma or degree from a public postsecondary institution. Colleges accounted for 81.2% of graduates who received a certificate or a diploma. Among the students who obtained a degree, 2% graduated from a college, compared with 98% from a university. Three fields of study accounted for over half of the 2015 graduates from colleges and universities: business, management and public administration (21.5%); social and behavioural sciences, and law (15.1%); and health and related fields (14.3%). The top field of study for men was architecture, engineering and related technology. The number of male graduates in this field of study has been increasing steadily for a decade. For female graduates, business, management and public administration has remained the top field of study for the past 24 years. The number of international students, which has been increasing for almost two decades, rose 3.0% in 2015/2016, a much slower pace than in the previous four academic years. International students represented 10.9% of enrolments in Canadian postsecondary institutions in 2015/2016. British Columbia (16.5%) had the largest proportion of international students. Almost half of all 2015 graduates had successfully completed a program at the bachelor level or above; that is, 37.1% received a bachelor's degree, 9.6% graduated with a master's degree, and 1.4% obtained a doctorate. Among the 29,952 international students who graduated from programs at the bachelor level or above, 38.6% received a master's degree, while 5.8% obtained a doctorate. 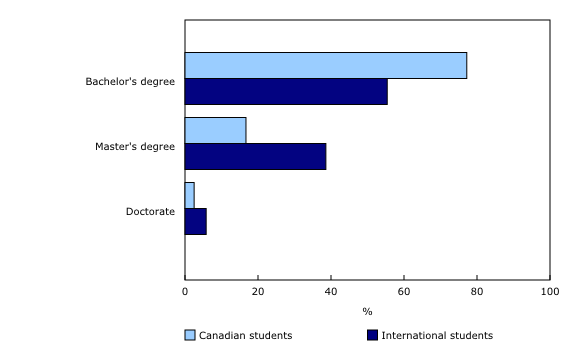 By contrast, 16.7% of Canadian students graduated with a master's degree, while 2.5% earned a doctoral degree. Canadian postsecondary institution enrolment data for 2015/2016 and graduate data for 2015 are obtained from public colleges and universities using information from the Postsecondary Student Information System (PSIS). The counts exclude students enrolled in apprenticeship programs. Enrolment and graduate counts for certain institutions are preliminary or are based on estimates. The PSIS data are subject to annual revisions. These revisions are applied to include new data submissions, any updates to classification and changes in concepts. The levels of enrolment presented are not meant to represent a complete enumeration of all students at postsecondary institutions during the 2015/2016 academic year. Rather, they are based on students enrolled in postsecondary institutions at the time of the snapshot date; that is, a single date chosen by the institution that falls between September 30 and December 1. Therefore, students who are not enrolled during this period are excluded. This has a greater impact on colleges as they have a continuous intake of students and offer shorter programs. Enrolments are based on program counts and not on student counts. If a student is enrolled in more than one program as of the snapshot date, then all of his/her programs will be included in the count. Graduate data are published based on the calendar year. It should be noted that some programs at the bachelor level and above can be offered in colleges. A summary table is now available.